Twelve US Navy sailors have been wounded after their MH-60R Seahawk helicopter crashed aboard the American aircraft carrier USS Ronald Reagan currently deployed in the Philippine Sea, officials said. 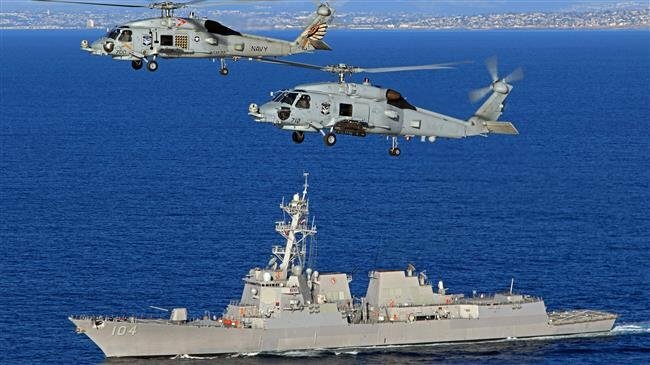 “Injuries ranged from minor abrasions and lacerations to bone fractures,” said Lt. Joe Keiley, a spokesman for the US Navy’s 7th Fleet in an email statement following the Friday incident as cited in a report by pro-military news website Task & Purpose. “The sailors that had the more extensive injuries were medically evacuated to a hospital in the Philippines,” Keiley added noting that all of the military service members were in stable condition. The spokesman, however, did not elaborate on the cause of the crash, further asserting that he was also not able to offer more details about the types of injuries that Navy troops had sustained due to what he referred to as privacy restrictions in the Health Insurance Portability and Accountability Act. He added that the war ship’s medical department continues to monitor the injured sailors who remain aboard the massive aircraft carrier. According to the report, the military helicopter crashed on the carrier’s flight deck shortly after 9 a.m. on Friday as it attempted to make an emergency landing a little while after takeoff. Navy investigators are looking into the cause of the crash, said a military newsletter, which also noted that families of the injured sailors have been notified.